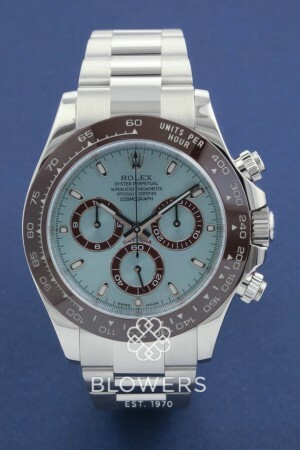 Platinum Rolex Cosmograph Daytona Model 116506. Case diameter 40mm water resistant to 100 meters. Light blue dial with brown outer sub-dials, luminous applied hour markers. Brown Tachymeter bezel. Platinum oyster bracelet. Box and papers. SKU: 3006202. Categories: Daytona, Gents, Rolex.